Giant interactive touchscreens, video walls and conference rooms swathed in HD screens promise an immersive and collaborative workspace. These flashy multifunctional displays and robust software applications are intriguing because they're like unified communications in a box. They offer a slew of UC features like collaboration, cloud services, video conferencing and mobile capabilities. The immersive collaborative workspace provided by these multifunctional displays offers an interesting contradiction in a world where many devices have shrunk. A few vendors of note in this immersive, visual workspace include Bluescape, Oblong Industries, Prysm Inc., and Sensory Technologies. Enterprise users might be interested in these types of multifunctional displays and software applications if they need to collaborate in real time across distances while also annotating content. Interestingly, in the world of interactive whiteboards, UC's leading collaboration vendors, Cisco and Microsoft, have either discontinued products or stumbled to deliver them. 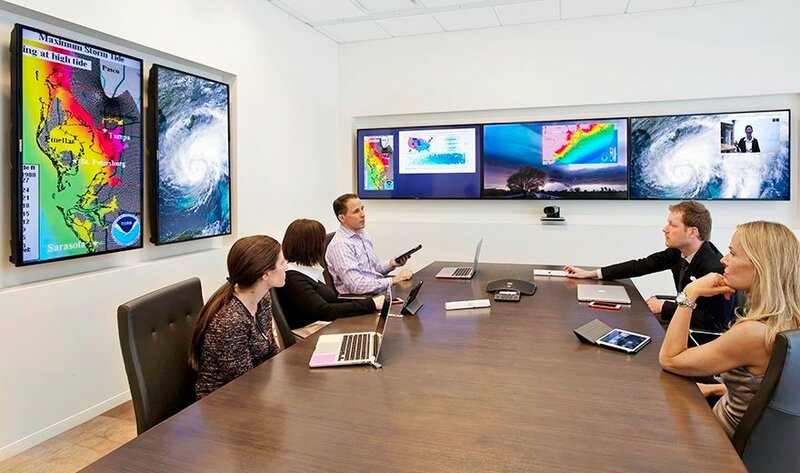 While Cisco offers immersive telepresence products, the vendor discontinued its TelePresence Synch, an interactive whiteboard. Cisco divested Synch to Avizia, a telemedicine company that still sells the product. Microsoft, for its part, announced the Surface Hub in early 2015. During the rollout, shipping of the large-screen collaboration device was delayed twice in seven months, and pricing for each model jumped by $2,000. Microsoft announced in late March that the Surface Hub is now being shipped to business customers. The Surface Hub has two sizes: an 84-inch, 280-pound model, and a 55-inch display. They are priced at $22,000 and $9,000, respectively. The multifunctional displays feature whiteboarding and touchscreen capabilities and are loaded with Microsoft software, including Skype for Business, Office, OneNote and universal Windows apps. Photo: Oblong Industries' Mezzanine features multifunctional displays that can surround a room with several streams of content. What UC features would you want in a multifunctional touchscreen?